When you think of Tioga Downs, what comes to mind? Perhaps it’s horse racing or casino games, which may be the Tioga County business’ biggest claims to fame. But Tioga Downs Casino Resort, which has expanded significantly in the past few years, also hosts concerts and class reunions, helps visitors unwind in its spa, and offers shut-eye and a swim at its hotel. A golf course, restaurants and bars – Tioga Downs offers quite a bit, as it turns out, even for people who would never consider placing a bet. The Nichols business employs 730 people in a wide variety of careers, from hospitality and gaming to security, finance, accounting and more – and they’re hiring. In fact, you’ll find Tioga Downs recruiting on the SUNY Broome campus through opportunities in the Applied Learning & Career Center as well as regional job fairs. This is the first in a series of stories highlighting Tioga Downs, and the SUNY Broome alumni who work there. Their jobs are varied, from the back office to the gaming room floor. And it’s not uncommon for someone to start at Tioga Downs in one department – say, food and beverage – and later transfer to another, or to work their way up the company ladder. “Get your foot in the door,” advises Human Resources director Karen Shelp, a SUNY Broome alumna. Internships can lead to full-time careers, as can part-time jobs, she noted. To kick off our series, we’ll start with Karen herself. 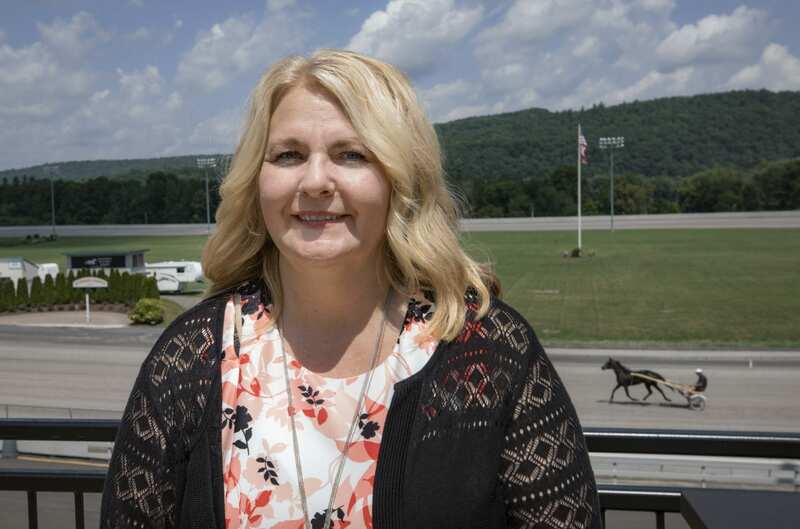 As Tioga Downs’ Human Resources director, Karen oversees a wide range of activities, from employee recruitment and training to managing benefits and union contracts, overseeing policies, writing the employee handbook and more. On a recent day, she led students from Cornell University on a tour of the facility. “HR always changes,” she said. The Johnson City native began her college education at Broome – then called Broome Community College – and graduated with a degree in Business Administration in 1985. She then headed to Binghamton University – then called SUNY Binghamton – to earn a Bachelor’s of Science in Management three years later, with a concentration in HR. After that, life happened: She went to Cape Cod, had two children and eventually returned to the Southern Tier, joining Tioga Downs in 2008. They had 300 employees then, far fewer that the 730 post-expansion. “I fell in love with the atmosphere of the place and the opportunities to grow,” she said of Tioga Downs. It’s been a while since she was a Hornet, but Karen remembers the experience fondly. She paid for her own education, thanks to the low cost, and knew she would successfully transfer to her chosen destination school. She made the President’s List and aided her peers as a tutor. She connected with her professors, and was impressed by one who also had his own business – a boon for someone in a Business Administration program. Class sizes were small, too – just as they are today. These days, she is on the other side – reaching out to students at SUNY Broome and other colleges with job and internship opportunities. Many people don’t realize the wide scope of careers within the hospitality industry, she reflected. Stay tuned for upcoming stories in this series!